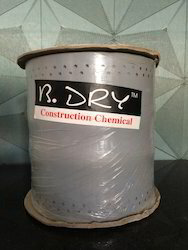 We are a leading Manufacturer of bdry polyflex wp waterproof coating, b dry sbr 295, b dry sealing tape, b dry conbond acrl, bdry fiber glass mesh and b dry conproof iwc from Secunderabad, India. B Dry Polyflex WP Flexible Waterproof is a brush or roller applied cementations coating used to provide a 2-3mm Waterproof coating for concrete, stone and brickwork both internally and externally prevents seepage of Water, salts and pollutants, whilst still allowing the substrate to breathe. This product is specifically Designed for applications where crack bridging properties are required, to ensure continual waterproofing Even when the substrate beneath cracks and moves. Available in 1 LT, 5 LT, 10 LT, 20 LT.
SBR 295 bonding admixture is a styrene butadiene copolymer latex which is specifically modified to be compatible with cement bases mixes. It enhance mechanical properties such as adhesion, flexibility , compression and impact strength of concrete and improve the thin section fragility of cement when used as coating. Available in 200 ML, 1LT, 5 LT and 20 LT.
B Dry Sealing Tape is a NBR rubber elastic sealing tape with low textile content and textile edging. 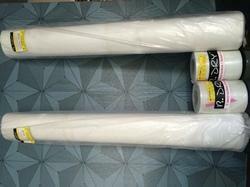 The tape exhibits excellent recovery characteristics and is fully silicone. compatible. For use it corners and to cover joints. Lateral Direction : > 36.7% Lengthwise Direction. Moisture Vapour Transmission Resistance coefficient : 8400 Equivalent air thickness sd : 5 m .
Water pressure resistance : 3 bar. Repairs to reinforced concrete structural members like columns, beams and slabs is becoming increasingly necessary, on account of the corrosion of reinforcement steel. Corrosion leads to several other distressing aspects like cracking, spalling, elimination etc. Repairs to these damages calls for special techniques and materials. Conbond Acrl Strengthens the microstructure of cement hydrated Structure By forming a polymeric spatial network in its voids, complementing the cement paste characteristics. The resultant mix has vastly improved tensile and flexural properties and also modified pore system of very low porosity and permeability. 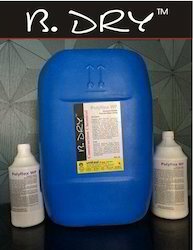 This versatile copolymer dispersion is suitable for repair mortars & grouts , rendering, floor screed etc. Conproof IWC is a integral waterproofing compound contain a blend of specialty chemicals which when incorporated in concrete reduces permeability and facilitates the construction of water tight structures. 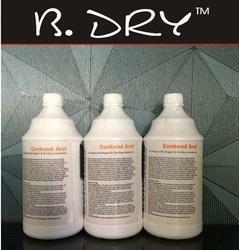 It makes the concrete waterproof to resist both hydrostatic pressure and capillary absorption. Available in 1LT can and 5LT can. B. 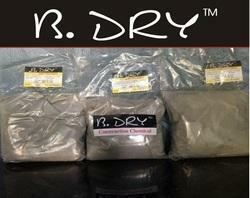 Dry Microfine Cement: is a micro -fine material with particles much smaller than normal cement. 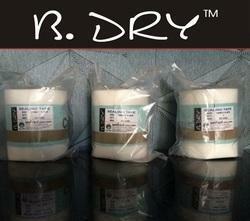 It is produced in special equipment to achieve particle distribution in a well designed range. 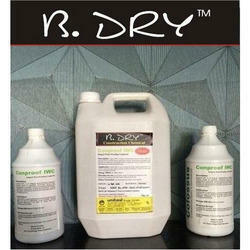 b dry cement has an average particle size of 4 to 5 microns; the top size d 90 is only 10 microns. The computed Blaine value is around 8000cm2/gm. Due to its high fineness the product has extremely good penetration when used for grouting of voids or micro - cracks in concrete or rock or voids in soil. Its penetration characteristics when used with recommended admixtures are comparable to chemical grouts such as silicates and acryl amides, but pose no problems of toxicity to the environment. Packing size 1.25 KG and 25 KG. Pen-Con-Seal is a penetrating, ready-to-use, clear, nontoxic, water-based blend of chemical ingredients which react with the free lime and crystallize with these calcium hydroxides to become an integral part of the concrete. It forms a chemical bond, not an adhesive bond. Pen-Con-Seal is designed for brush, wool roller or low pressure spray application to the surface of concrete, stucco, and masonry products, above grade like terrace, bathroom, wet room or below grade like water tank, dam, basement, power house, interior or exterior. Conseal W is an aqueous solution of potassium methylsiliconate, mainly for water repellent treatment of porous material used in the construction industries. Silliconate used for imparting a colorless water repellent surface finish to mineral building material without significantly reducing water vapor permeability. 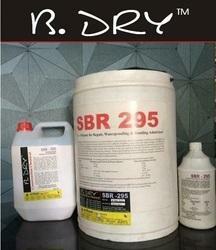 Looking for B-DRY Construction And Waterproofing Chemicals ?